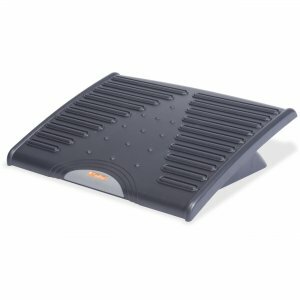 Extra-wide, adjustable footrest helps relieve lower back strain by elevating your feet. Ergonomic design helps correct your posture when working at a desk. Low-profile pad easily adjusts to various angles and heights by using foot pressure. Ergo ridges massage your feet when you take your shoes off. Lightweight, nonskid base is made of a sturdy plastic for long-lasting use. Attractive style matches any home or office setting.